As a tribute to the end of one of the warmest summers on U.S. record, this seems like the perfect time to feature the traditional Japanese food of Neba Neba. Neba Neba is traditionally eaten more during the summer months. The nutrient packed ingredients served cold replenishes the body, especially during the extra stresses of heat. When served on top of rice it is called Neba Neba Don. Natto, okra, tororo, seaweed and raw egg served over rice. In Japanese Neba Neba means sticky or slimy. All the ingredients in this dish resemble the texture of natto, and are just as good for you. I heard that Nebe Neba Don is served in cafeterias in Japan, and I wouldn’t be surprised why. All the ingredients are super foods themselves. Okra is known to stabilize blood sugar levels, help with digestion, and is filled with vitamin C and antioxidants. Tororo is high in protein and full of nutrients and vitamins such as potassium, magnesium, zinc and vitamins C & B1. Seaweed, a good source of potassium, iron and iodine, is becoming more popular with parents too, replacing the craving for salty chips. Eating the ingredients raw also provides more benefit, compared to eating them cooked. Studies have shown the longer vegetables are cooked under high heat the less vitamins, minerals, and enzymes are retained. 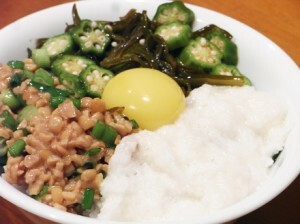 Some vegetables, such as the okra in this recipe, can be quite bitter raw. To help reduce the bitterness some prefer to remove the seeds and quickly blanch the okra before cutting it up. No step by step directions this time, but prep time should be quick since all the ingredients are raw. Try it out for yourself and leave us a comment!